What is with me an exclamation points in the title…? Anyway! Yeah, Nhan over at the appropriately-named NhanFiction decided to tag me in this silly little Blog Game Award. The, uh… goal? of this thing is to answer some questions and then let people know that you’re passing the torch their way. Here we go! The craziest thing I’ve done is give guild leadership a shot. I suppose I could tell that story sometime. Y’know, if you didn’t get enough of my hate-filled rants in the Nyaruko thing. My favorite thing is my mint-condition, still-in-the-box Japanese copy of Chrono Trigger. Twenty-six bucks. Metrocon Four years ago. Best purchase of my life. Apparently, I can play support at 3 AM when I’m half-asleep. I’m sorry, I have played support at 3 AM when half-asleep. In my defense, we won. Okay, now to single out a few people who you fine folks should visit (and probably are, really). Also, feel free to, y’know, do this thing if it pleases you. 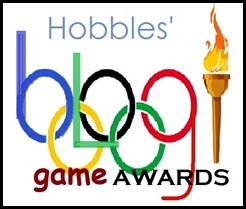 2 Responses to Blog Game Award! I’m sorry, I write posts.